Here we are going to see how to check whether the given number is divisible by 8 or not. All the thousands are divisible by 8. Hence the number is divisible by 8, if the last three digits of a given number is divisible by 8, then the given number will be divisible by 8. Whenever we want to check whether the given number is divisible by 8 or not we have to take only the last three digits.Only if the last three digits are divisible by 8, then we can say the whole number is divisible by 8. Test whether 4328 is divisible by 8? In this problem we have to check the number 4328 is divisible by 8. Let us consider the last three digits "328" of the given number. Now let us check whether it is divisible by 3 or not. Test whether 5432 is divisible by 8 ? The last three digits of the number 5432 is "432". Test whether 1000 is divisible by 8 ? All thousands are divisible by 8. So the entire number is divisible by 8. Divisibility Test is the topic in which we are going to see the shortcuts to predict one number is divisible by another number without doing too much calculation. Once we remember these rules we can easily divide two numbers without a calculator. The learning divisibility test is more important for all the students who are in school to do the calculation in easy way. 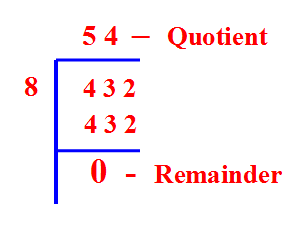 After having gone through the stuff given above, we hope that the students would have understood "Divisibility by 3"
Apart from the stuff given above, if you want to know more about "Divisibility by 3", please click here.